Off late, our actors have been committing a major fashion faux-pas. Wearing the same design again and again in different colors! 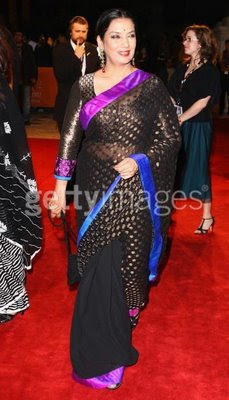 After John, Priyanka, Mahima and Mads, we now see Vidya too wearing the same sari style but in a different color! How long before the concept of stylist comes to Bollywood? We are waiting! Vidya Malwade wore an ombré dress to the Arjun & Anjalee Kapoor Fashion Show and while she was right on the money where trends are concerned, her dress itself left a lot to be desired. Ombré refers to fabric (and now, even leather! Remember Prada?) having a dyed, printed, or woven design in which the color is graduated from light to dark and is a big trend..its been around for a bit now and is going to be big for Spring. We saw many designers incorporate the look into their Spring 08 collections! 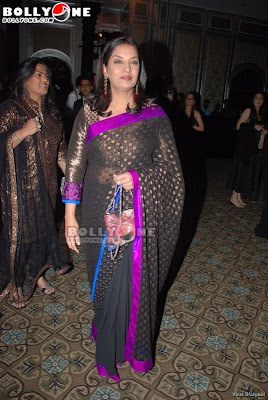 Vidya’s dress just doesn’t have that clear color gradation, and, instead of the play from dark to light, the color tone stays dark and only varies in the color itself! And that strip of navy/black at the waist does nothing for the dress; the shoes, too matchy! Ms. Azmi, we really like you. Really do. Except, you make it so darned hard for us when you choose to dress like this. Not once, but twice. I think Yana Gupta looked absolutely gorgeous with her short hair-do, very spunky, young, and she totally worked it! Rather unfortunate that she chose to wear that wig while promoting the launch of new handsets from Sony Ericsson! Nothing is worse than a wig looking like a wig. Except, when its a bad wig that looks like a bad wig!! She looks effortlessly well put together in her beige diaphanous top at one event and then at another she turns up in a horrible halter with those rosettes! And what you can’t tell from that picture of hers in that red halter is that she has hair-clips on on either side of her head, and the kicker is the fact that on one side she sports an orange clip and on the other a light,lime green!!!! Don’t even ask!!! Gul Panag goes from fab to drab in a heart-beat and has more schizophrenic-fashion-personalities than Bjork has feathers on her swan costume!